Janes360 is reporting that the Philippine Coast Guard has inked a 90M Euro ($113M) deal for the purchase of five vessels. One is to be an 82/83 meter (270 foot) aluminum hulled patrol vessel and the other four are 24 meter (79 foot) patrol boats. NavyRecognition, reporting on OCEA participatin in the EuroNaval trade show, has some details on the OPV 270. This entry was posted in International, News, Shipbuilding and tagged Cutter x, Philippines by Chuck Hill. Bookmark the permalink. This might be seen a another candidate for Cutter X. It is not clear how comprehensive the aviation facilities are, but the cost is certainly attractive. This 270 and four patrol boats built for $113M, not in some low wage country, but in France. This may be the result of some Government subsidy of the Shipbuilding industry. 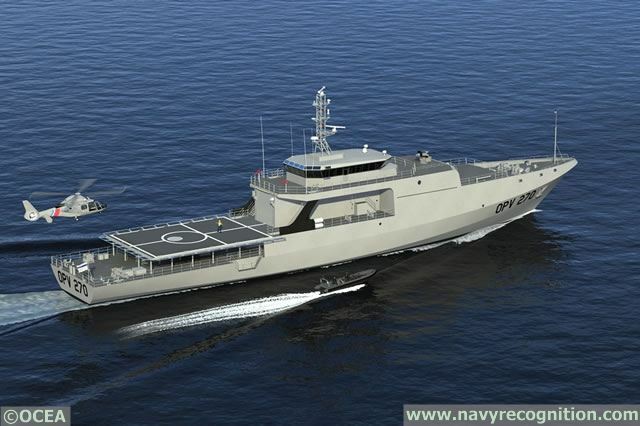 It is also almost certainly built to commercial rather than naval standards. My best guess is “you” are paying for these hulls.